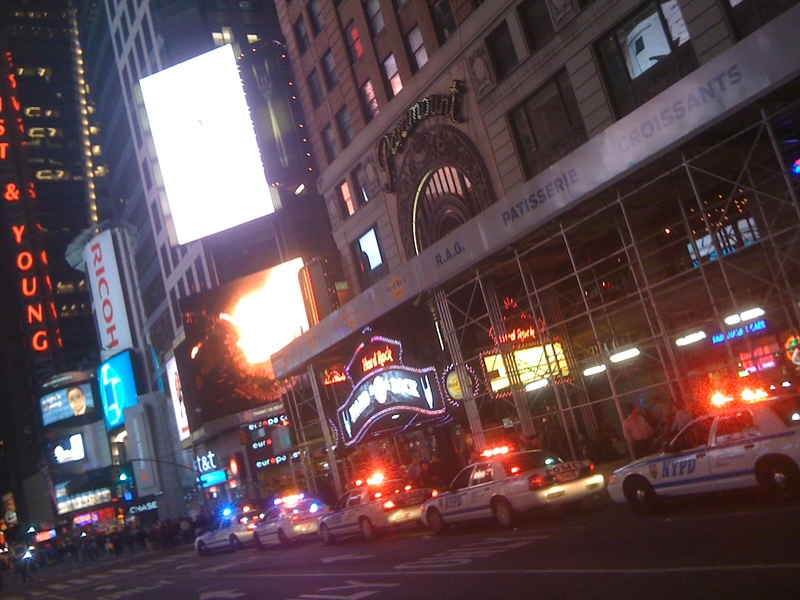 Update: on the morning of 5/2 I woke to news of a terrifying attempted attack on Times Square. Whatever aesthetic criticisms I have of the place, I love the people who enjoy it and I’m disgusted and a little scared by the attempt. I thought of deleting this post out of respect, but instead I’m choosing to keep it – while adding this important paragraph. The Egyptians left us the pyramids. The Romans, well… Rome. Every time I go to Times Square (which is pretty darn infrequently), I think: This is what our civilization will leave for the ages. To say I don’t feel particularly proud would be an understatement. Other civilizations worshiped gods and stuff. We worship … buying. Here’s a sight from last night that I thought was especially salient in illustrating the rather pitiful combination of things our country sometimes stands for: a long chain of NYPD cars with flashing lights (show of force) parked beneath a preposterous array of energy-guzzling advertisements. Brute strength and consumption. Brilliant. arab christians think jesus is allah, and muslims believe in jesus but think he was a prophet of allah. arab jews believe in allah too, but think jesus was not a prophet. Indeed, this persistent translation problem has been discussed on this blog: http://longgonedaddy.wordpress.com/2008/12/15/why-is-allah-never-translated/. It’s unfortunate the DJ Quik did not educate himself on the true meaning of “Allah” (of course, any devout Christian in the world would need to say she believes in Allah if speaking in Arabic), but I figured it would be silly to hold Quik to the same standards as, say, the AP.